Love and laughter filled the air at our specialist unit at Turnchapel recently, when our team helped Domminick, a patient there, and his wife Hilary celebrate the renewal of their wedding vows. The touching service in the Harbour was followed by a joyful wedding reception in our specially decorated Conservatory for visiting family and friends of the couple. 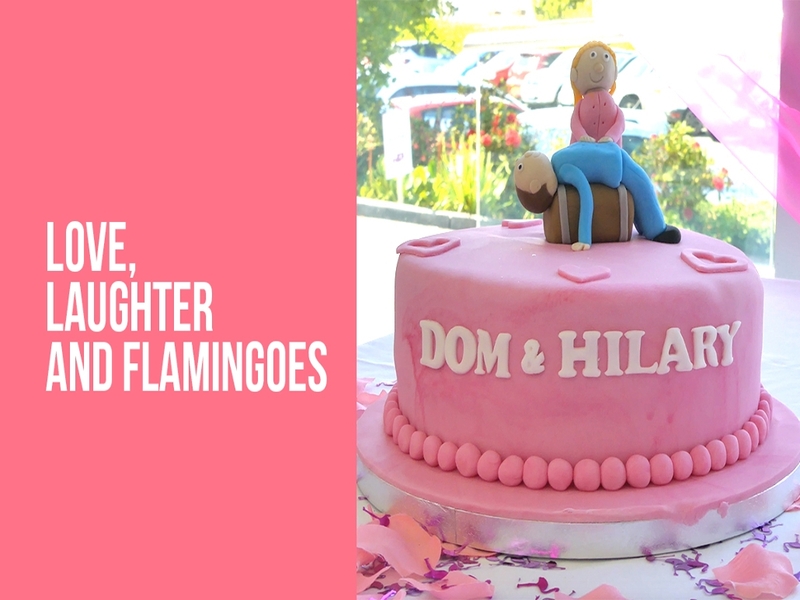 The pink flamingo theme chosen by Domminick and Hilary reflected their fun personalities and raised lots of smiles, with the bride – who arrived by vintage car – sporting flamingo pyjamas and slippers, and guests enjoying flamingo cupcakes with their champagne. Also on the menu were ‘poo’ cupcakes, which – along with the groom’s poo-themed slippers – were a light-hearted way the couple chose to reference Domminick’s bowel cancer. The beautiful flowers, including Hilary’s pretty posy and Domminick’s button-hole (worn with his Muppets t-shirt), were kindly donated by Plymstock florist, H Watts. Keen to go the extra mile to make the day even more special, our team transformed Domminick’s room on the ward into a honeymoon suite, complete with rose petals on the bed and ‘love nest – do not disturb’ sign on the door. Sister Karen Thorrington said: “The whole occasion was so lovely, happy and uplifting, fulfilling Domminick’s wish for it to be all about the couple celebrating their love for each other. He wanted to create a lasting memory for Hilary of fun, not sad times.